Some early predictors a month ago are getting solidified, and a new report now says the chances of the upcoming winter bringing with it a potentially severe El Niño are 66%. A warming trend in the Pacific points to the possibility that California could be in for a drenching on the level of the winter of '97/'98  and those who were here back then will know what that means: Start resealing those arks now. This is good news for the California drought, now in its third or fifth year depending on who you ask, but bad news for everyone in flood-prone and landslide-prone areas, especially after so much dryness that the earth is going to be especially apt to washing away. 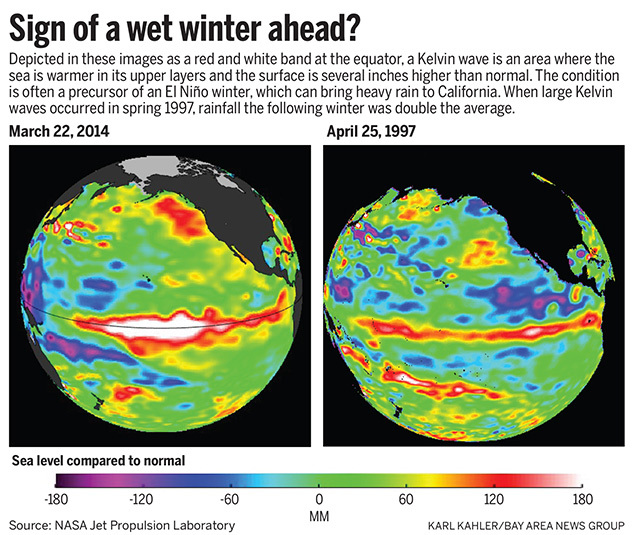 The biggest predictor right now is what's called a Kelvin wave in the middle Pacific, as the Mercury News reports, which is a mass of warm water pooling near the surface  and the one scientists are observing right now is much larger and hotter than the one that preceded our last severe El Niño winter, in 1997, as illustrated below. It's also the largest seen since these waves been recorded, in the last 35 years. There is a difference between mild and moderate El Niño years, of which we've had several in the last decade, and severe ones, with moderate years often bringing little more than average rainfall to California. Since 1951, there have been five winters with strong El Niño conditions. In four of them, rainfall between the Bay Area and Bakersfield was at least 40 percent more than normal. Some of California's wettest winters occurred during those winters, including 1982-83, when mudslides killed 10 people along Santa Cruz County's Love Creek and San Jose's Coyote Creek burst its banks, flooding Alviso under 8 feet of water. So, brace yourselves! There are still no guarantees, as the professionals are saying, but they're also saying of that Kelvin wave, "This isn't something we see every year or even every decade." And if you were going to skip out on Tahoe next year after several frustrating years of no snow, you might want to roll the dice and lock something down sooner than later. Chances of many, many feet of snow are looking better.